Looking for a unique bridal shower theme? 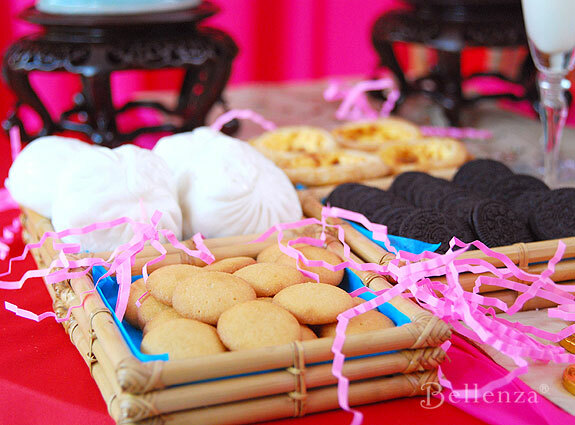 Why not host an Asian themed bridal shower? 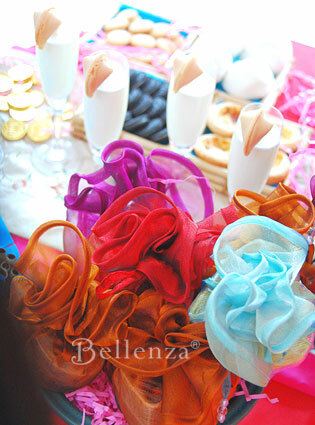 Let the creative juices flow and craft a party inspired by the cultures of East Asia, but with a Western undertone. Choose materials and decorative elements that impart an authentic vibe–such as paper lanterns hung above the tables, antique ceramic bowls to present guest favors, and bamboo trays to serve an array of treats. 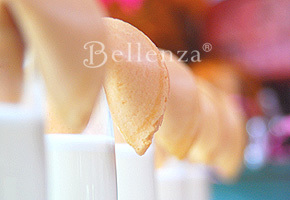 Prepare shapely sweets like fortune cookies, as well as round-shaped treats symbolizing prosperity and fortune. To tie all the elements together, experiment with a color palette that breaks away from the traditional red and gold to include hues like orange, pink, and even aqua. The challenge is how to recreate the ambiance with a more contemporary look. 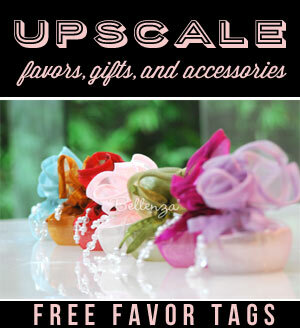 Bring in bright hues of red, pink, and even blue! 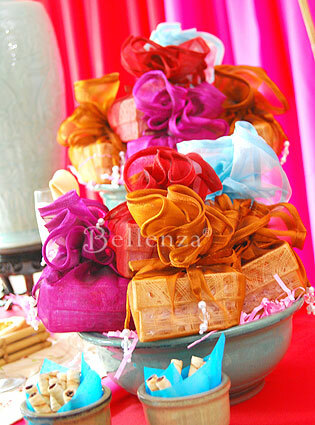 This theme is all about bringing out color to express a festive and auspicious mood for the guest of the honor. 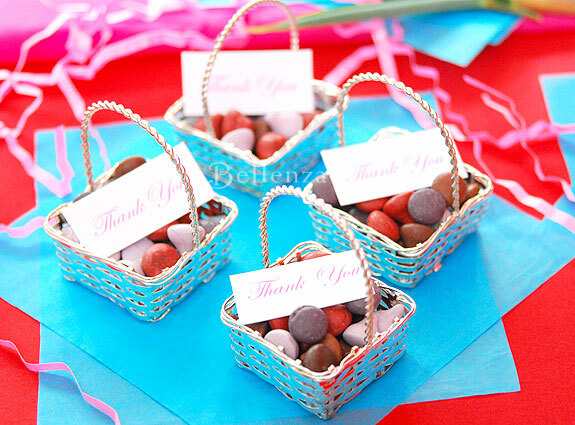 1 – Baskets of treats – fill small silver baskets with colorful candies and add a “thank you” card. 2 – Use creative decor – add some faux accents wtih an Asian flair and make use of beautiful pottery. 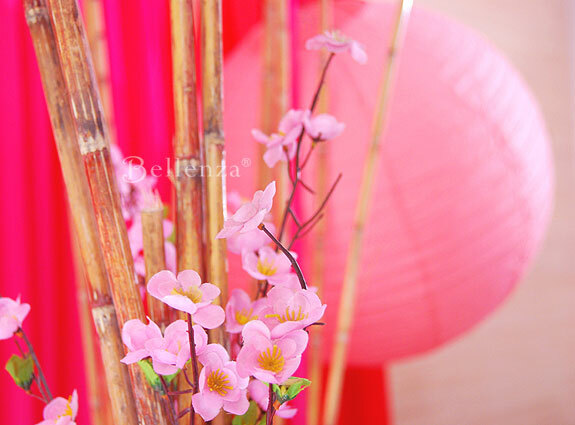 3 – Pink color palette – for a feminine look in pink, add mini flowers and pink lanterns. 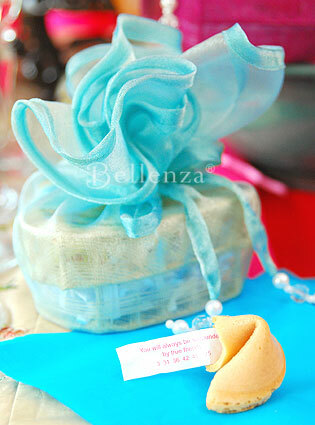 See our cherry blossom themed bridal shower for more Asian-inspired table decorations and favors. 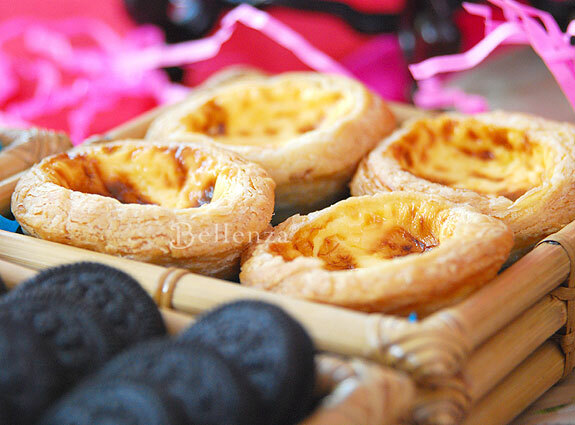 4 – Serve up a dimsum faire – consider a catered party menu with delicious dimsum dishes. 5 – Mix up the look of your party decor with centerpieces that are favors, too. 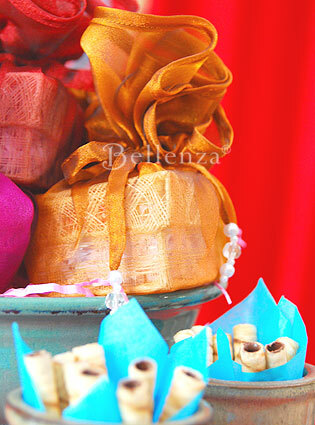 Give out these fabric gift wrapped boxes filled with Chinese almond cookies. This idea would be great for a Chinese New Year’s party, too! 6 – East meets West goodies – in this display, you can serve Chinese steamed pork buns, egg tarts, almond cookies, and Oreos! See more Chinese wedding inspiration with a fusion of ideas. 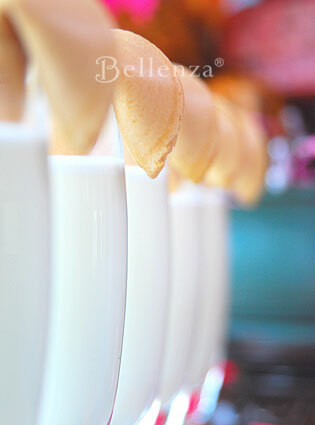 7 – Milk and cookies – give fortune cookies as favors, while milk served up in champagne glasses get a cool cookie garnish! Also, it’s a perfect idea for a Chinese Wedding Banquet! Substitute champagne instead of milk. Where can you obtain those lanterns? I’m thinking of using them for an engagement party with a cherry blossom theme. Also, what kind of colors do you recommend? I personally love the color red, but was wondering what else is nice for such a theme. 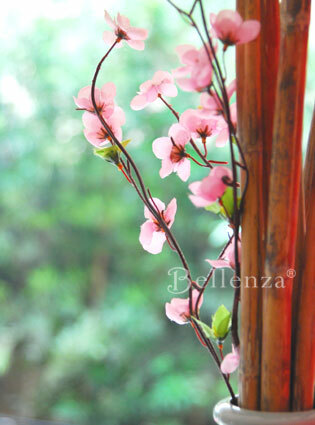 If you are having a cherry blossom theme, pink and white lanterns would be great colors. Hello , I’m in the entertainment industry ( set design ) and just want to let you know that I’m very inspired and impressed by the the simple , doable concepts you have. This east asian theme ( i’m asian myself – originally from Tokyo) is really eye-catching and saturated with brilliant colors. Good color combinations! 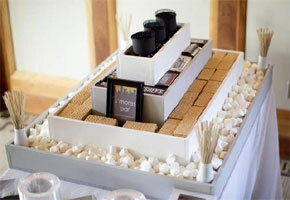 I’m looking at the East Asian-inspired Bridal Shower slideshow, and wondering if you can direct to where I can purchase the square bamboo trays shown on slide #3. Hello Michelle. We purchased these trays from a flea market in Bangkok. 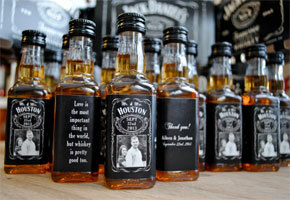 I think you might be able to find something similar in places such as Pier One or CostPlus World Market. If you still don’t find them, you can also check out some stores that carry Oriental kitchenware items. Hope this helps! I love the idea for the milk served in champage glasses! I’m planning to serve lychee-infused cocktails and then serving them in chic glasses that will be garnished with our shrimp wonton appetizers shaped like fortune cookies!